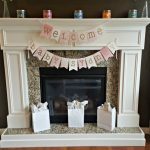 I was provided with items from Minted.com to facilitate this post. All opinions are my own. This past weekend, we had the chance to celebrate the newest addition to our friend group. I’ve known Sarah for a few years, but I’ve actually been friends with her husband since Kindergarten! 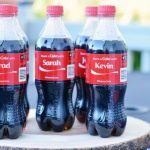 Sarah is due with their little girl next month, so a few of us gathered to welcome her into the world. 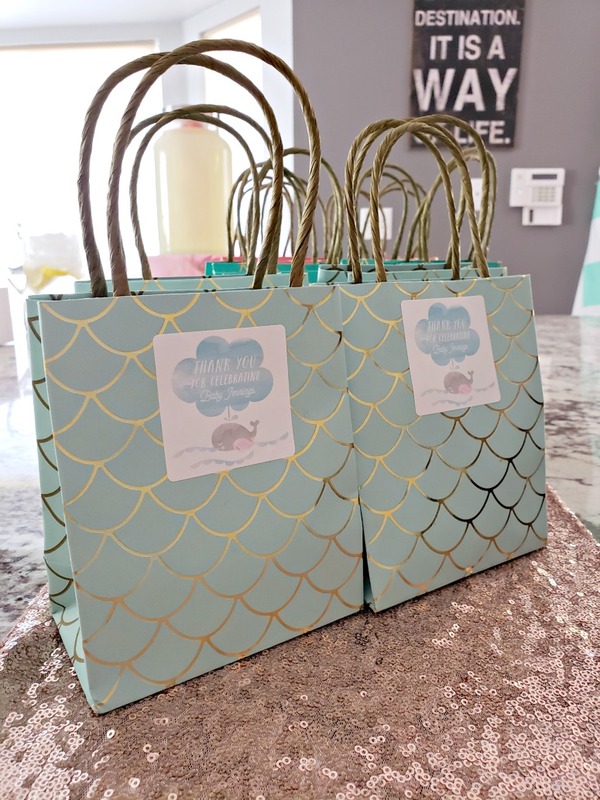 For the shower theme, I decided to go with Rose Gold and a hint of ocean in order to go along with her nursery theme. 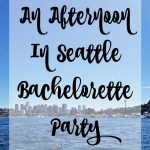 Minted has amazing invitations and party items. 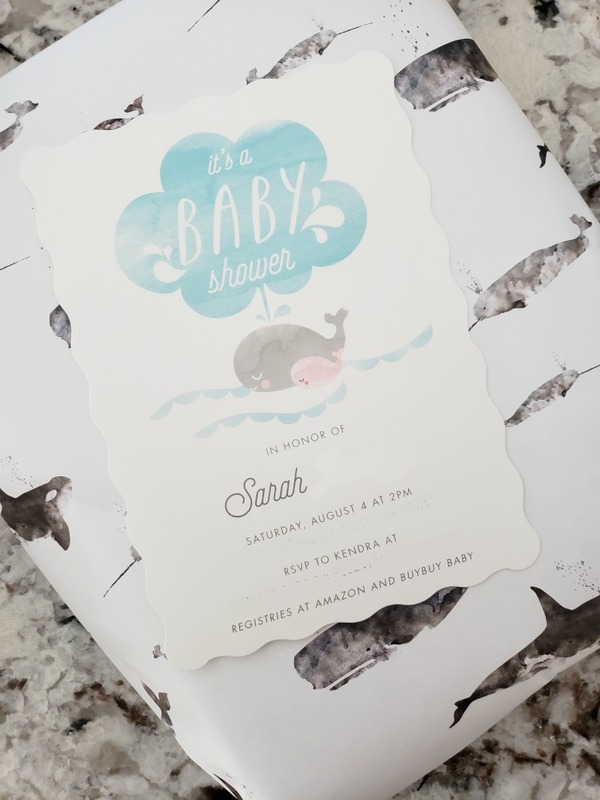 That was the first place I started looking when I started planning this shower, and absolutely LOVE these Whale Love invitations. I love how the little baby whale can change colors between blue and pink. Since much of this invitation was blue, it was nice to add a touch of pink. In addition to invitations, I got some fabulous Whale Wrapping Paper from Minted as well. It comes as 5 large sheets, and was the perfect size for her present. In addition to invitations, I got some matching stickers for the favor bags. I couldn’t make up my mind for what I wanted do do as favors, and ended up getting some cute mini jams, and added a few to each bag. While it wasn’t rose gold, I loved these balloons and tassels from Target. 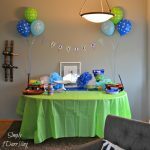 They were the perfect items to hang in our front window and create a fun backdrop for photos and celebrating. I don’t do shower games. I think they’re for the most part lame, and would rather do some sort of fun activity. We had two activities for the afternoon. First was a station to DIY wooden blocks. I got some pre-cut wooden blocks and cut scrapbook paper to the same size. We applied it using school glue and in the next couple weeks I’ll go over them with mod podgs. The second activity was a fun headband station. 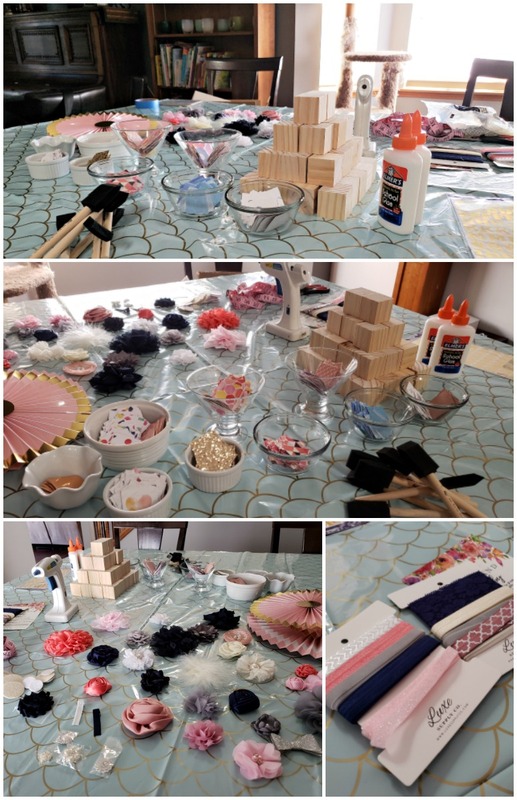 You might remember that we did this last year at Michelle’s Pink & Gold Shower and it was a huge hit! I got a couple headband kits from Etsy, and they were a huge hit among the guests. 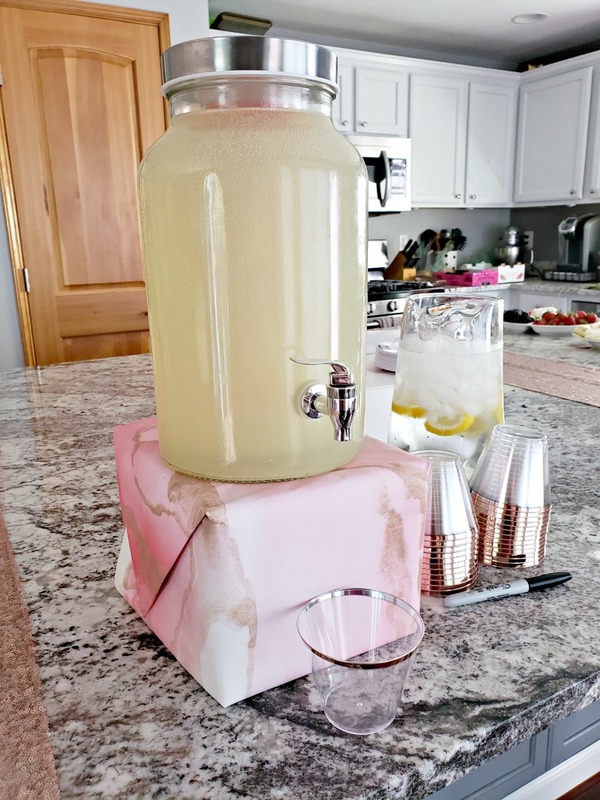 Sparkling lemonade is always a delicious choice for parties so I served that along with some lemon and lime infused water. For the ice in the water, I put some frozen watermelon in an infusing drink dispenser. The cups, silverware, and plates were all rose gold themed, and I got so many comments on how nice quality they were. 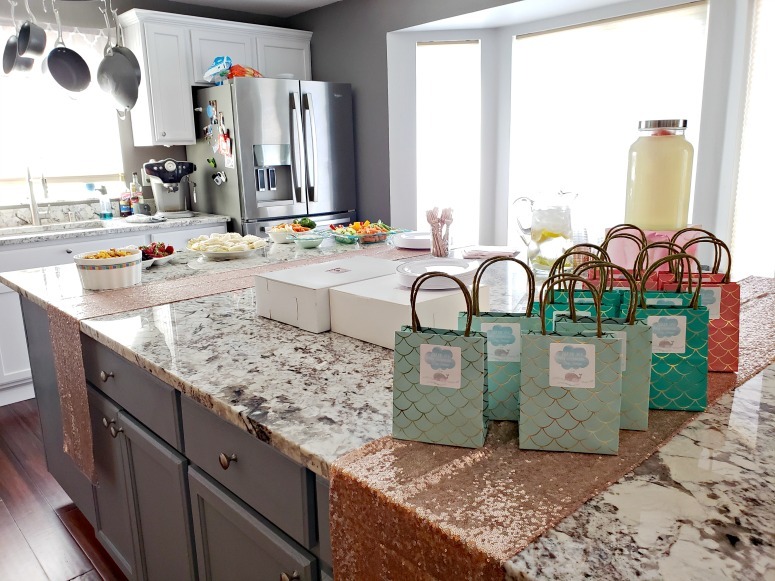 For the food, we enjoyed a vegetable platter, cucumber tea sandwiches, fruit with Devonshire cream, and Chicago mix popcorn. The party started at 2PM so we really just needed some munchies to enjoy while we celebrated. For dessert, we enjoyed some delicious mini Lemon-Raspberry cupcakes, and vanilla cake pops. How gorgeous are these rose gold sequin table runners! They are pretty inexpensive, and a great way to add a bit of sparkle to the day. Meet Billy the Goat. 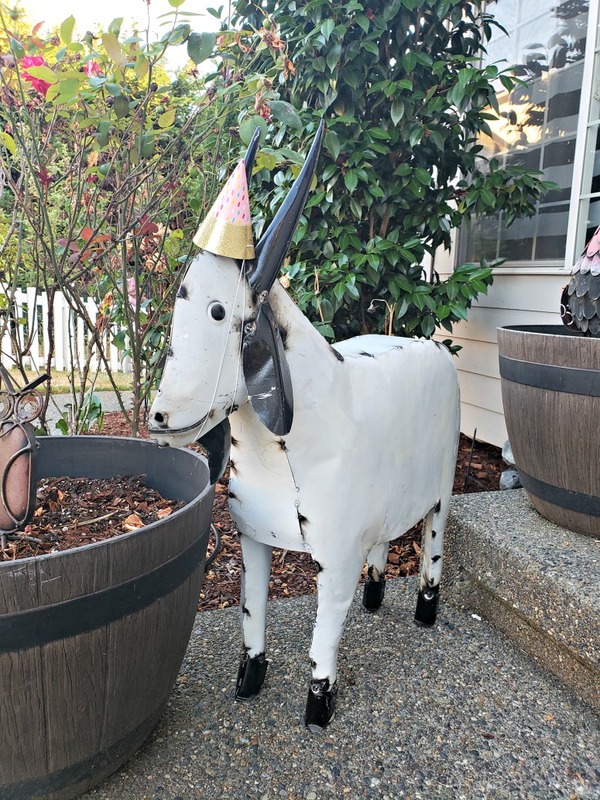 He now lives on our porch (as of a couple weeks ago) and I thought he needed to celebrate the party too. His mini party hat was the perfect addition! We had such an amazing time (although I kinda forgot to take photos during the party). 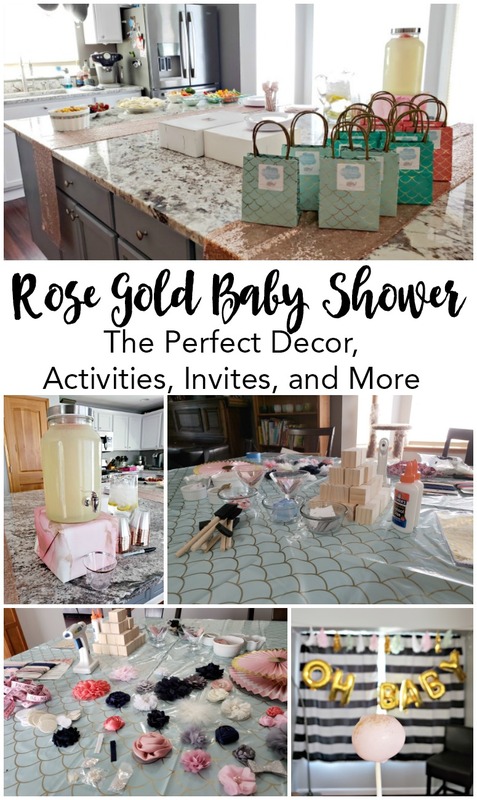 A Rose Gold Baby Shower is a fun and easy theme, and turns out to be absolutely gorgeous! 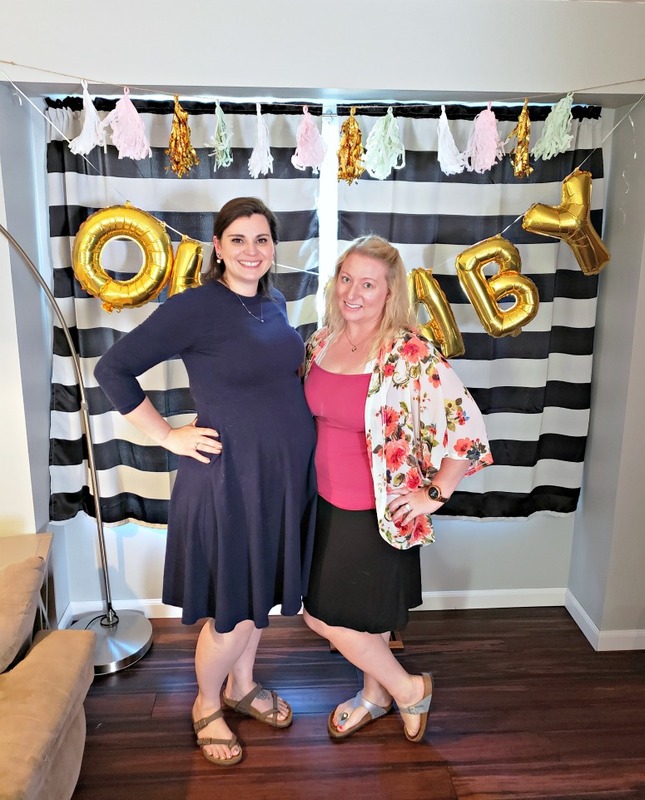 We can’t wait for little Baby J to join our group soon! 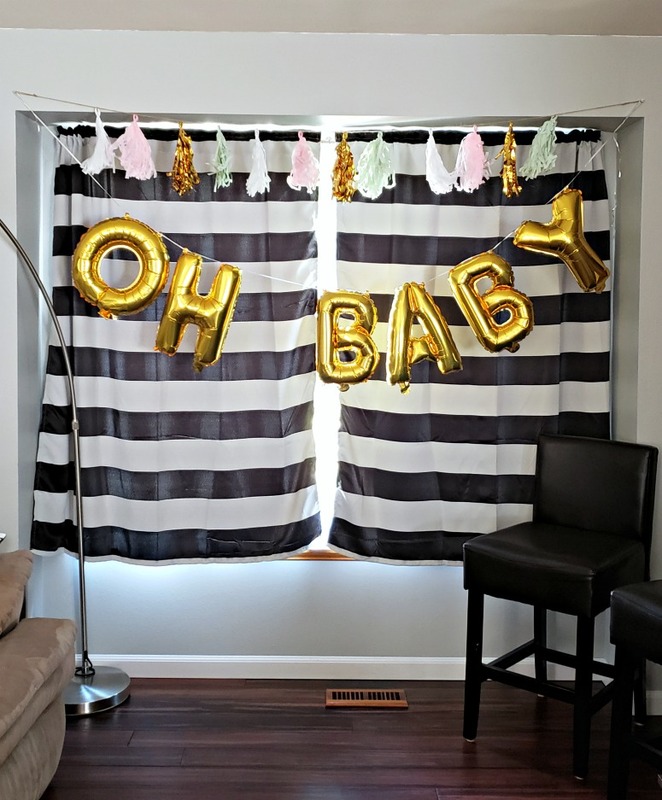 Looks like such a cute shower! Love the theme. That is super cute! Love the invitations! I love the whale theme, adorbs!